Is the latest addition to Korg's popular micro range as good as it looks? Some good sounds onboard but ultimately falls short on the connectivity and price front. Portable and looks great. Some good pianos and electric pianos onboard. Some sounds rather useless. Limited connectivity. The mini-keyed microKorg has become hugely popular since its launch back in 2002 and has since spawned the microSampler, microStation and the upgraded microKorg XL. This latest microPiano builds on this now familiar 'micro' concept but instead applies it to piano, electric piano, strings and various other percussive sounds - steel pans or celeste, anyone? "The mini keyboard is surprisingly playable, to the extent that we would actually consider using this as a serious instrument at gigs." It feels solid enough to instil confidence, yet is lightweight too. The mini keyboard is also surprisingly playable, to the extent that we would actually consider using this as a serious instrument at gigs and in the studio, though we wish the keyboard had more octaves for authentic piano playing. Offering up 61 varied sounds - changed by holding the Sounds button and pressing any of the keys - the highlights include the piano, electric piano and the piano/string layers. They are great and inspiring to play, though many are too swamped in reverb. 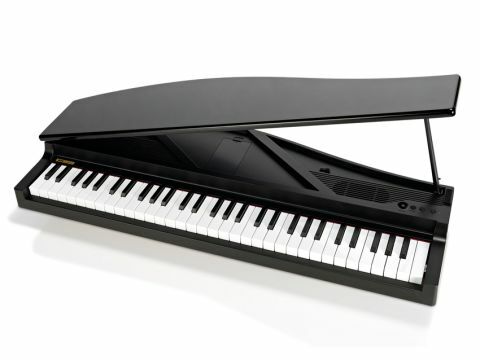 After a few moments with the microPiano, we felt inspired by its simple concept and general sound and the fact that you can mess around with it just about anywhere (it can be battery powered too) is a massive bonus - this would be great to throw in the car or take on holiday. It's a shame the other onboard sounds aren't as good or as usable, including celestes, a not so good clavinet, steel pans, vibes, toy pianos, pipe organs and some other phrases and demo songs. These in particular are unnecessary filler and to us cheapen the overall feel but I suppose they might appeal to the home piano market. Much more useful and versatile sounds should have been put onboard for the money, though. The built-in speakers are of adequate quality yet underpowered but opening/shutting the lid gets you some extra options in terms of projecting the sound. Unfortunately, having only a 3.5mm output (which doubles as a headphone jack) makes it a pain to connect to any pro gear. A proper jack output is sorely missed and a big oversight. Also - get ready for this - no USB port and no MIDI. As such the microPiano is therefore a closed shop, unable to integrate with other studio gear and computers. No matter how much you might love the sounds you're always going to have to play them. This is a missed opportunity when you consider the microPiano's price. All in all the microPiano is a mixed bag. It generally sounds, looks and feels good and plays well but it falls way short in terms of connectivity, and is a pain to fit on a stand. Yes, it's unique and we're sure it will find its quirky place at some gigs, in the home and as a convenient practice piano but it's a real shame that it won't be taken seriously by pros and as such sits rather uneasily with the rest of the fun and portable but undeniably useful and powerful Korg micro range. While we admire its looks and enjoyed having it in the office, in the real world we'd always stump up the extra £80 and get a 'proper' microStation from Korg instead.